21st century cool, and centuries of history make the Hotel Amigo one of the sleekest-looking hotels this side of Brussels. The bright and cheerful contemporary interiors by designer Olga Polizzi make it easy to forget that the hotel is over 500 years old but if you do, look down at the paved cobblestones circa 620, and be humbled… Belgian accents include prints by Magritte and Broodthaers, Tintin, and sumptuous Pierre Marcolini chocolates delivered at turndown or at the excellent Ristorante Bocconi. It’s all unapologetically Belgian, from its prime location at the heart of Brussels - the hotel is literally opposite the Grand Place, which makes getting to the bars, galleries and shops a cinch - to the friendliness of the staff. For a room with a view, the Armand Blaton Suite, with its balcony that provides a premier spot for taking in all the action of the Belgian capital, is our dig of choice. Contemporary style keeping the hotel's charm and an eclectic Flemish character. 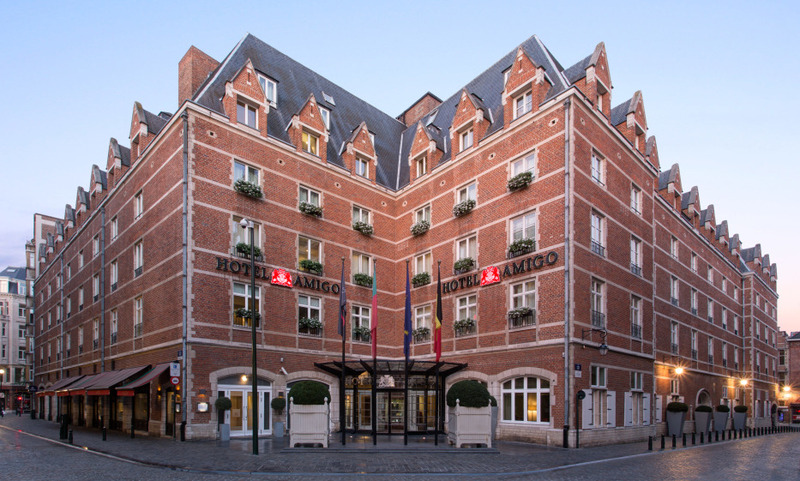 I was very pleased with the Hotel Amigo and if I travel to Brussels again I will book the Hotel Amigo. Hotel Amigo was a great experience. When I return to Brussels, I will try to stay again. A great hotel in the middle of historical Brussels. Definitely will stay next time I visit Brussels whether it’s business or leisure related. One of the best hotels i've been too, thanks to its quality, comfort and friendliness of the staff. The hotel’s location is great but a bit difficult to get there. The staff is super professional and friendly. The hotel is impeccably clean. The deluxe and executive rooms do not offer showers but only bathtubs, which is a bit unfortunate, but not too much of a worry. Otherwise, we were delighted with Grand Luxury Hotels’ service, the quality of the hotel and especially the staff Thank you and see you soon. Beautiful hotel, great location for lovers of La Grand Place! The staff is very pleasant and offer impeccable service !! I really like the Hotel Amigo due to it’s central location and manor style interiors. The room was just perfect, spacious, well decorated, and with a massive and comfortable bed. The buffet breakfast had a lot of quality options and the staff were always at hand if you needed anything. I would love to come here again. A luxurious place with helpful and friendly staff always ready to listen to the customer! It’s a beautiful hotel, with comfortable and cozy rooms. The hotel bar’s jazzy atmosphere and excellent wine and liquor options are in my opinion, the highlight of the hotel (with the quality of staff). An excellent place in Brussels close to major tourist attractions without the usual inconveniences, despite some noise on Thursday evening. The staff is competent, efficient and discreet. The establishment brilliantly allies luxury services with a very friendly atmosphere, I would go again on my next trip to Brussels and I highly reccomend it to friends and family. Excellent location - very good service . Overall very enjoyable stay and would return there. Excellent location in the centre of Brussels. Efficient, friendly and professional staff. Beautiful hotel, very professional and present staff. Superbly located, again without hesitation! Slightly austere feeling upon arrival regarding the decoration, space and staff. Then, quite satisfactory and very friendly throughout the stay. Very nice hotel and we will return if we stay again in Brussels. Two little issues we had : our soft boiled eggs for breakfast arrived hard. Our room key did not work anymore. Fortunately a very friendly porter who had accompanied us the night before opened the door for us.